I’ve owned my 2000 W Reg 1.9TD VW T4 since November 2004 and I’ve been happy with its rather modest performance and impressed with its economy. 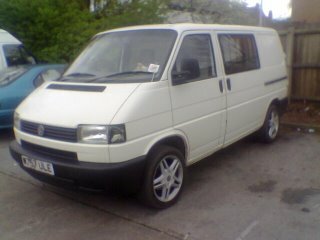 It was originally bought as I planned to convert it to a camper van to replace a rather slow unreliable VW T25 I owned and then we would jack in our jobs and travel Europe for 6 months plus. Unfortunately that has not happened and probably won’t for a while as Bec my partner is pregnant. So it has been used as my daily transport also for a few wild camping trips to Scotland, the Peak District and a 3 day event. I’ve fitted alloys, swivel seats, windows, insulated the van and built a rock and roll bed. It has served me well and I’ve done nearly 35 thousand miles in the van since I bought it. In that time it has never missed a beat and the only thing I’ve had done other than normal servicing and tyres is to replace the alternator brushes as these wore out. I probably would have kept this T4 for a long time until I decided to take my Stuart Taylor Motorsport Phoenix Fireblade kit car to the Nurburgring. About a week before I was leaving I had a tow bar fitted and then used my T4 to tow a trailer back from York that I bought on Ebay. The trailer is a big heavy duty ex farming trailer and the van struggled along at 50mph on the trip home. During this drive home it occured to me that it was going to be bit painfully slow to tow the trailer 1000 miles once my kit car was loaded on. In the end this was not an issue as in the end I drove my kitcar to the Ring and left the T4 at home. However during the trip to Germany I had a few minor set backs but in the end was lucky and everything worked out ok, I don’t think I’d be this lucky again so when I visit the Ring again I’ll need a suitable towing vehicle. I think what tipped me over the edge into buying a 2.5 was when I was overtaking an old granny in a Micra on the M1 in North of Chesterfield. I was half way past her and I hit a slight hill and my T4 started to slow down as usual, the Micra did not slow and she then slowly but surely undertook me. I looked over at her and glared but she was completely oblivous to me as she sat about an inch from the steering wheel, staring blankly forward listening to Terry Wogan.